Paulownia kawakamii (Sapphire Dragon Tree) - Paulownia kawakamii is a fast growing deciduous tree to 25 to 35 feet tall from Taiwan and southern China. It has enormous heart-shaped 5 lobed leaves that are softly hairy on both surfaces. The large round brown flower buds form in the fall and are held conspicuously on naked branches until they emerge just prior to the leaves in the spring. The pale lilac-blue flowers are 1-2 inches wide in long terminal panicles. Hardy into USDA zone 6. Plant in full sun in most any soil. Prune while young to desired form after which little attention is needed. The wood is very light, soft, and warp-resistant so is used extensively in Asia for making wooden chests (including coffins), musical instruments, and wooden shoes. We have had customers request long straight limbs to use in making surfboards. Paulownia are considered to be deep rooted trees that generally do not lift pavement but they will seek out leaky sewer and leach lines so placement of the tree by at least 20 feet away from these is recommended. The 15 year old tree in our nursery is already 35 feet tall so this tree may actually get a little larger than we thought, though most of its growth was in its first 10 years and it has seemed to slow. The genus Paulonia was named in honor of Anna Paulowna, the princess daughter of daughter of Tzar Paul I of Russia and who married King William II of the Netherlands, and is a genus of 17 deciduous Asian trees in the Bignonia family (Bignoniaceae). 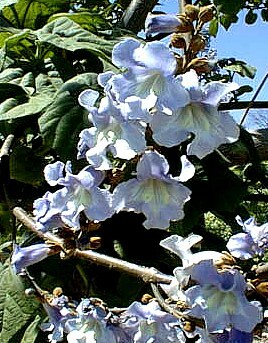 The most common of the Paulownia, P. tomentosa or the Empress Tree, is unknown in its natural habitat yet has escaped cultivation to become naturalized from New York to Georgia.